NOTE: ALL PATTERNS OFFERED HERE ARE FOR YOUR PERSONAL USE AND ARE NOT TO BE USED TO MAKE ITEMS FOR SALE ON ETSY OR ELSEWHERE. THANK YOU! For your pawlitical animal or yourself! Here’s a link to the chart. Add it to your favorite dog sweater pattern or make a scarf for yourself. Here’s one way to let everyone know you — and even your dog — resist Trump, Bannon and the rest of the current government. Use my #RESIST chart (available in two versions) to knit yourself a hat, headband, scarf, cowl, sweater or even some pupwear. Both my dogs’ sweaters are knitted using a standard sweater pattern and the 36-character chart. The slightly bigger chart would be more appropriate for a larger dog or a human sweater or scarf. Have fun! A cuddly scrunch-down collar, puffy, fluffy heart shot through with a bone, soft crochet trim and edges lined with a sweet floral print. Who loves ya, baby? For dogs with 10, 13, 16 and 18″ chest. Knit in three shades of DK weight yarn (5 sts=1″), optional lining and decorative button. Intermediate to advanced knitting skills needed, as well as basic knowledge of crochet. Optional hand-stitching. Click on the very obscure and puny link above for this FREE PATTERN in pdf format. The clear, bright pink of this lovely Malabrigo colorway, Geranio, took me back to a day in the summer of 1969, when my college friends and I picked buckets full of fresh raspberries on a farm in Pennsylvania. That evening, I found a recipe for “Raspberry Fool,” a deep-dish cobbler, and we all devoured it while watching the men walk on the moon and marveling at how far our country had come. One skein ~ quick and easy! 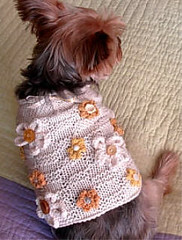 This is my first crochet dog sweater pattern, inspired by that long-ago raspberry patch. This little item uses almost all of one skein of Malabrigo Merino Worsted (216 yards) for the medium size and is a very fast project. Fits pups with 14, 16 or 18″ chest. Sometimes the air conditioning is just too chilly for a small pup. That’s the time to don our ‘Basket of Daisies,’ a sweet little cotton cropped sweater appliqued with knitted daisies and pretty buttons. Perfect for a hot summer day on the back of the sofa ~ or just when you want to re-create that summer feeling. Fits pups with 10-11″, 13-14″, 15-16″ and 17-18″ chest. 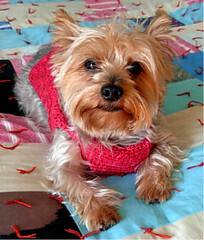 Here’s a quick and easy knit that makes use of two of Rowan’s prettiest yarns ~ now at close-out prices ~ to work up a charming button-trimmed sweater for your doggie with a button-on hoodie or “fur” collar. Pattern includes directions for basic sweater with two hem styles, faux fur knitted collar and “fur” trimmed knitted hoodie. Optional, but recommended, fabric-lined neck. Fits dogs with chest sizes 14, 16 and 18″. Requires 1 skein each of Rowan Ribbon Twist and Rowan Big Wool Tuft; size US 15, 17 and 10 straight or circular needles; a dozen or so assorted buttons; optional neck lining fabric. Click on the ‘furrrocious’ link, above. Great for travel or that Glamour mag dress-it-up office-to-evening switcheroo! Wrap yourself in warmth and luxury with an edge. This oversized triangular angora/wool wrap is knitted with Cascade Cloud 9, Berroco Ultra Alpaca and Crystal Palace Kid Merino. The body of the wrap is knit in stockinette stitch, and the ruffle is a fluted chevron pattern. The pattern is here in pdf format for FREE DOWNLOAD. favorite chunky “jewels” at the neck. Sized for pups with 14, 16 or 18″ CHEST. Uses one skein worsted weight yarn, craft pearls (beads), and beginning to intermediate knitting skills. 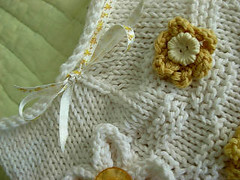 Optional simple crochet trim and hand-sewing. Follow the pdf link below for the FREE PATTERN. ERRATA: There is an error in this pattern for those who have already downloaded it as of 3:09 PM EDT on May 8, 2008: On the directions for the FRONT, the sentence “Increase one st at each end of next two alt rows. (12 ~ 14 ~ 16 sts)” should be deleted. Pattern has been corrected for those downloading later. EDITED TO CORRECT: SIZED FOR DOGS WITH 14, 16 OR 18″ CHEST, NOT NECK! Go, team! Get rea dy for the fall gridiron action by outfitting your pup in a pretty handknit that shows just whose side she’s on. Pattern includes directions to knit this sweater supporting the University of Alabama Crimson Tide, along with guidelines on how to refashion the design for a more-masculine look and substitute other mascots and decoration for your own favorite team. Uses one skein worsted weight yarn, felt, embroidery thread and beginning to intermediate knitting skills. Optional simple crochet trim. Follow the pdf link below for the FREE PATTERN. say it’s your birthday. To celebrate my favorite model’s ninth, here’s a free knitting chart to decorate a sweater for your pup, your child or yourself. Knit it intarsia style, or simply duplicate stitch it on. Then trim with “sprinkles” — delish! Thanks to Tricksy Knitter for the free chartmaker! Thank you for the darling sweater pattern! That is so cool! Thanks for sharing this adorable pattern! I just finished up knitting your Puppy Love sweater and it turned out great. My Rufus loves it! Keep up the great work. Alice, thank you SO much for your kind words on your blog!! Those pictures of Rufus are amazing ~ he and Willie should have a Zoolander-style “pose-off”. Again, thank you, and keep checking back for more patterns. Hi, would you be able to mail me the pattern for the dog sweater as i was unable to find the obscure link. Love your blog. Found it after I purchased the Christmas Dog Sweater Pattern. 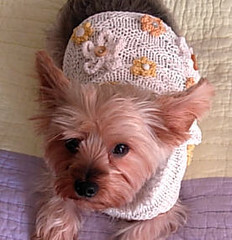 It might be March but I have six yorkies so I am going to go find the right color yarns and get started. Its so cute I can’t wait! I know I will be a regular visitor here. Haven’t knitted in years but am re-discovering it as a relaxation technique :-)). I need your help I need a Ripple Stitch Crochet baby Sweater pattern If possi\ble free I am a low income senior citizen! I suggest you visit the Knits by Rachel blog (there is a link to your right on my Blogroll). She has zillions of free patterns, and plenty of crochet. Good luck! thanks – i am going to make the grey gardens shawl – loved the movie! hand sew the pearls tomorrow. It is absolutely adorable and so quick and easy. I thought I would look at your lining pattern but can’t seem to locate it on your blog. Wow. Just love the dog patterns. Wish I could knit better than I do. Will definitely be trying to make the dress though. Thanks for the .pdf format. I’ve just recieved my invite to join Ravelry today. 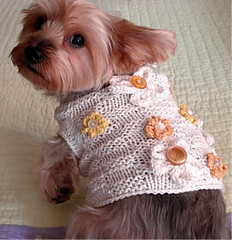 I signed up and was looking around and found your beautiful patterns for dog jumpers……so cute. I’m saving up to buy a Shih Tzu dog next year, and wanted some dog jumper patterns so I could knit some for my local Dogs Trust charity, your patterns are just the thing. Incredible patterns! I’m gonna be busy, I see. This is absolutely adorable!!!!!!!!!! The yorkie just makes me want to squeal he’s sooooo cute. You’ve got a great model there! I adore your your sweater patterns.. I have 3 yorkies that will love these!!.. Thanks for sharing them.. I can’t wait to try to do one.. I just finished the LBD for my “Little Baby Dog” she looks adorable in it. Would like to make the Boyfriend Sweater. I’ve read through the directions and it sounds like it is knit in the round. Is that correct? Thanks. Ohh thank you so much for free doggie patterns. I really love your blog. You are an angel. I am gonna knit every one. Also looked around for the lining directions, but can’t seem to find it. Any clues?? Thanks for your wonderful pattern!! I feel like a little kid at Christmas. Thanks for the adorable dog sweaters. My Chloe (Havanese) will love prancing around in them! Thank you so much for sharing your grey gardens pattern… it is beautiful! Absolutly LOVED the little black dress. My babies will enjoy wearing it out on the town! I am trying to make your dog sweater, “Raspberry Fool” and I’m not understanding one of the abbreviations. It is “sk tch” at the end of rows. Could you please tell me what that means. Sk tch stands for “skip turning chain,” the chain that began the previous row. Last winter I knitted the little black dress in red without the pearls or ruffle for my poodle and put a trim of black funfur. He would not take it off and received a million compliments. I just want to thank you for the pattern and will start a new one today. What a great idea! I bought some hot pink wool and was trying to think how to make the basic sweater and then dress it up. This would work great! I am trying to make your Raspberry Fool and I can’t seem to understand the dc5tog. I looked it up on the internet and it explained how to do it, but it causes it to decrease for the next row. Could you please explain to me how to do this properly? I am trying to make this for my mother-in-laws dog. Thank you so much. Just put all 5 stitches into the 1 stitch. I, too, did it that way first, but it’s really a cluster stitch. These patterns are to die for adorable! I can’t wait to knit the LBD with Pearls for my Dachshund and Chiwiener. For the pup squad sweater, would this work in crochet? I have to make an STL Cardinals sweater for Luke the pug… and sadly my skills are only in crocheting. I have no idea! You would essentially be working up a whole new pattern. Good luck! In the directions for the little black dress, the ruffles, what does M1 mean? hi, i am 13 and i love knitting! 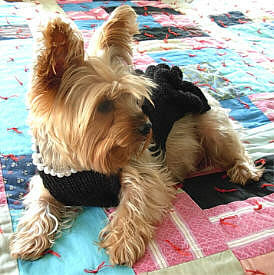 i tried your black dress pattern for our yorkie, and she looks adorable! thank you so much for the pattern, and i hope you will have some more soon. They are all just beautiful! Absolutely love your blog and patterns, and your model is adorable! thanks for sharing these patterns. Thanks! I have two Doxie cross puppies going to an adoption event in a few days and with these patterns they can go well dressed! This may be the ticket to catching the eye of the special human. I’am a self taught knitter for the past 15 years. There is always something knew to learn. My favorite yarns are, Kureyon and Lambs pride. I mostly like to make hats, baby blankets, but, now I want to step out of my comfort zone by learning to knit lace. Wish me luck on that one! I had a little yorkie for 11 years and lost him to renal failure. Your dog reminds me so much of Big Gus. Now I have a little chihuahua named Bubba.Com (no I didnot name him that). He has healed my broken heart. In fact he is asleep on my lap while I’am typing this. Well, I just wanted to say I love your site and hope to visit your shop on Etsy soon. Take care to you and your family, Rosa. PS sorry this note is so long! what if somebody wants me to make one and needs to pay me for it (I very RARELY knit for free – too busy) dont ever knit for money either – no body wants to pay what it is worth – anyway would it be a problem to use your free pattern to knit and charge for it ???? The patterns are not to be used for sale — sorry. If you want to charge your friends for the yarn, that’s fine, but as a money-making venture, I’m afraid not. Thank you so much for these darling free patterns. Can’t wait to see my Heidi Grace in them. Love from Georgia. Thank you SO much for sharing all of your patterns!! I have two Yorkies and it’s -8 degrees in Michigan tonight so we’ll be knitting FAST!!! Your pups are adorable too! After the other evening at Unwind and our conversation about pup patterns I was so happy to hear you posted it for no charge. The “little black dress (with pearls)” is absolutely adorable and I can hardly wait to knit it. I found your site after looking for dog crochet patterns. I have never knitted, but your sweaters make me want to learn. Can you tell me where and how I should start? Thank you for the beautiful patterns, I can’t wait to learn and use them on my Maltese and Mutigree!! Thanks for the dog jumper patterns! They are amazing, i cant wait to try some! 🙂 Thanks again. Love your sweater patterns. Just got a tiny maltese/shitzu mix and decided to try the raspberry fool pattern. I am having trouble with the front. I have tried to follow the directions in 2 different ways, but the piece does not look anything like the photo on the second page where it is connected to the back. I don’t know what I am doing wrong. Can you give me more explicit instructions for this part? The back turned out just right and looks so cute! I hate to have to have an unfinished pattern laying around. Thanks for taking the time to post these adorable patterns for all of us to use. RTR! The link is right after where it says, “Here is the pdf download.” i checked the link and it works. I’ve been working on the “Raspberry Fool” pattern and I am having trouble with the shaping row. Do you do a certain amount of stitches for the shaping row? I’m kind of lost at this part. I know the dog is really small but it looks like there are more than 2 rows of dc for the neck part of the pattern. Please help! I’m trying to make this for a Christmas present. Thank you for the wonderful pattern. After you complete the berry stitch section, you hdc (half double crochet) in each stitch across. For the shaping section, you continue hdc-ing acrosw in each stitch, but you hdc2tog the first and last stitch of each alternate row, for a gradual decreasing slope. After you complete this section you do one repeat of the berry stitch pattern (5 rows). That is the end of the back piece. If you are new to crocheting, I would really suggest you get a crochet reference book such as Donna Kooler’s Encyclopedia of Crochet, which has definitions of all the stitches used in my pattern as well as instructional illustrations. Good luck! Thank you so much! I realize I was doing the dc5tog instead. Silly me! 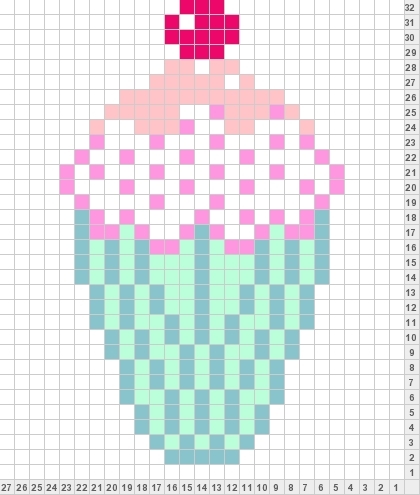 I am making the “Raspberry Fool” pattern and I have having a problem with the pattern. When I am making the berries the width of the piece keeps increasing. What am I doing wrong? I am still working on the raspberry fool pattern and have finished the back just fine. I am now having trouble with the front piece. The piece doesn’t seem to fit with the back piece. I tried increasing after decreasing but it still doesn’t work. Please help. 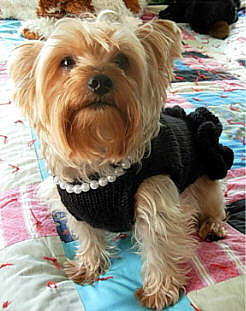 I just completed the “Little Black Dress” sweater for my Silky Terrier. I don’t see a place to post a photo but it came out fantastically! She looks adorable. I had to look up some of the stitches that I’ve never done before (K1, M1 and picking up stitches for the ruffle were a challenge.) but once I got the hang of it, I could not put it down. I was so excited to see the finished product. Took me about 2 1/2 days . Thanks so much for the pattern. I had some pearl trim on hand left over from another project so used that and just make a double row for more impact since they were much smaller than the pearls you used. I still had some left, so added a row of pearls at the beginning of the ruffles. It is the cutest sweater! Cheryl, the links are right on the page! I love your little black dress. I plan on making it for my new “baby”, a rescue papillion who thinks she is something else. She deserves a “string of pearls” for all the love she has brought to this house. Thank you so much for the pattern! can i sell the coats once i make them? As stated at the top of the Free Patterns page: ALL PATTERNS OFFERED HERE ARE FOR YOUR PERSONAL USE AND ARE NOT TO BE USED TO MAKE ITEMS FOR SALE ON ETSY OR ELSEWHERE. THANK YOU! I love the pattern “little black dress” but can’t find the directions….please help! I would also make it in a smaller size for a10 inch chest. 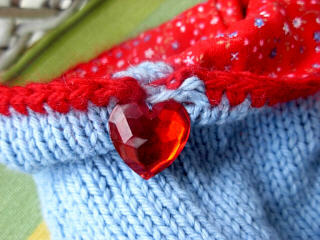 There is a link to the pattern on the Free Patterns page. 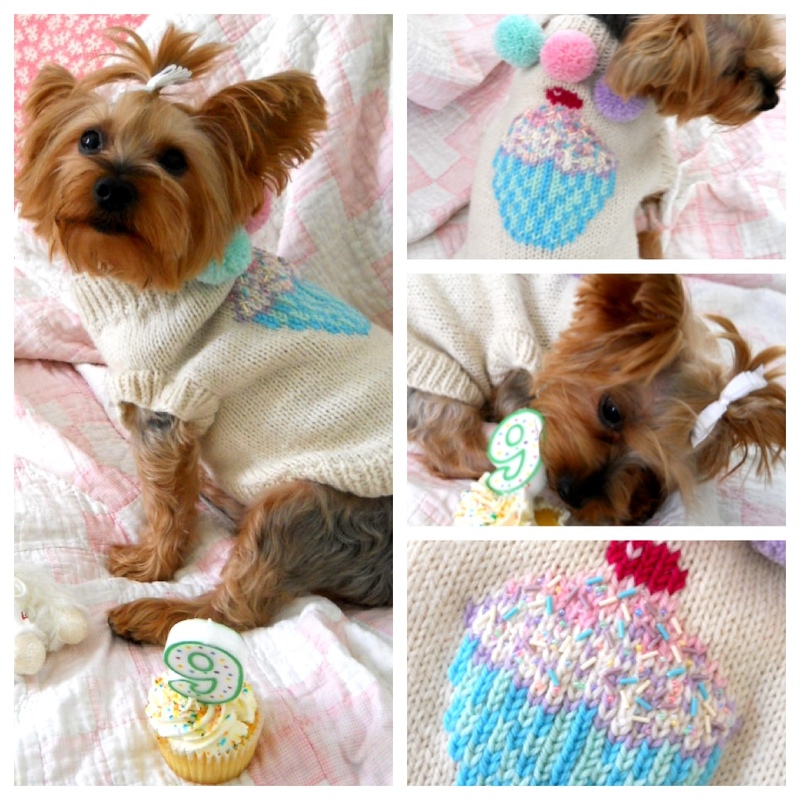 Do you have a pattern to add a bow in a sweater similar to the pupcake but a bow. No, I am sorry but I do not. On the Little Black Dress with Pearls dog sweater when increasing at the beginning and end of “at end of each of each (row?) following sixth row until there are 35 sts”. Just want to clarify that that is row 7 – 10 and not every other row which would be row 7,9,11,13. I have crocheted the “Raspberry Fool” twice as a raffle item for our local SPCA fund raiser. Both recipients love it. I am planning on doing one for my dogs. I am now making the Little Black Dress for my daughters dog. I don’t know often and remember only doing increases on every other row so wasn’t sure if I was doing it wrong. Thanks for posting all the free patterns. They are adorable. Christine, the pattern says, “Increase one st (stitch) at each end of fifth row. Continue in st st (stockinette stitch), increasing 1 st (stitch) at each end of each following sixth (RS) row until there are 35 (40 ~ 45) sts.” I apologize if this is unclear. What it means is you will increase one stitch at each end of the fifth row. Then, you will continue knitting in stockinette until you reach the sixth row after that, a right-side row. You will increase one stitch at each end of that row and do the same on every subsequent sixth row until you have 35, 40 or 45 stitches, depending on the number you started with. So no, you do not increase at each end of every row or every other row. Is that clearer? I hope so! AMAZZZING. 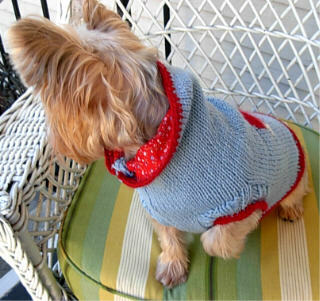 …I am a knitwear designer but not for my pooch.. You could start your own doggie line. I can’t wait to make for my Sweetpea. Thanks for sharing your incredible gift of designing for our darlings. I am having a problem with the raspberry fool pattern. I am on row 6 and I am concerned about the increase I am making on each row. I am doing the 5 DC which increases each row. Am I reading the pattern incorrectly? Help! , she is a senior rescue and in good health. Yes I am in S.California but will be going up to the Central coast where the winds can get quite cold. Excited to see the cute patterns on Pinterest UNTIL I click on open and I see a political statement AGAINST OUR PRESIDENT. #resist hurts American people. Oh, well — you get what you pay for.